The DB Pro systems are very popular building boosting solutions. The 65dB-gain DB Pro amplifier (801262) is a powerful yet affordable amplifier targeted at residential and small office installations with coverage of up to 5,000 sqft. DB Pro amplifiers are 3G boosters capable of handling all 3G voice, text, and data on most North American carriers. It is a dual-band solution for the common US and Canadian 850/1900 MHz frequencies (except Nextel/iDEN). This robust wireless amplifier features attractive, light-weight design with fully-adjustable gain to give you the power to remedy oscillation issues and fine-tune your system performance. This powerful wireless amplifier supports multiple phones and devices (cell phones, MiFi modems, data cards, and tablets) on multiple carriers at the same time. The complete DB Pro system, like most in-building amplifiers, consists of three major components including outdoor antenna, amplifier, and indoor antenna(s) connected with compatible coaxial cables and charged by a power supply. The outdoor antenna communicates with the cellular tower operated by your cell phone provider and is usually mounted on the standard 2-inch antenna pole on the roof or side of building. The amplifier, mounted indoors near a power outlet, is the brain and workhorse of the system. The indoor antenna (or antennas for larger or multi-floor area coverage) are the cell phone-facing components of your amplifier system. Most residential solutions are 75 ohm systems using standard RG-6 cabling and f-type connectors (typical coax cables used for most home cable TV installations). All DB Pro amplifiers and kits are 75 ohm systems which makes them very user friendly and very easy to customize of reinstall. The DB Pro is available as an amplifier-only item (801262) or as complete kits which are ready for installation and out-of-the-box performance (841262 and 841263). The kits are differentiated by the outdoor antenna type: Yagi (more powerful but directional) or Omni (less powerful but with 360 degree coverage). Both kits include the Best-Selling wide band panel antenna with wall mount (301155) which easily attaches onto any flat vertical surface with attached screws and mounting hardware. Multiple alternative mounting systems exist for the panel antenna so make sure you explore the Mounts category of Accessories. The panel antenna is truly one of the most versatile and powerful indoor antennas commercially available. Both kits come with three white low-loss RG-6 coaxial cables with F-Male connectors (20ft, 30ft, and 50ft), and one F-Female to F-Female barrel connector for joining two cables together. The Wilson 75 ohm lightning surge protector (859992) is highly recommended for all building installations to safeguard your amplifier system and wireless devices from lightning strikes. 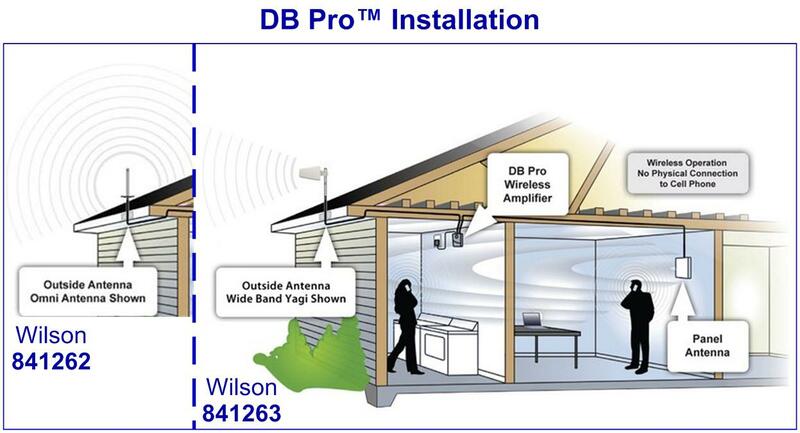 DB Pro Kit 841262 includes an Omni-directional antenna (301201). The only difference between these two kits is the outside antenna which is included. The Omni-directional antenna can pick up cellular signal from any direction. Since it is not pointed in the direction of a cellular tower, it is designed for areas of poor cellular signal caused by natural and man-made obstructions such as buildings or hills where low-height signal is poor. This outside antenna is faster to install since it does not need to be pointed at a nearby tower (although placing the omni antenna on the nearest unobstructed point to the tower location is still beneficial). 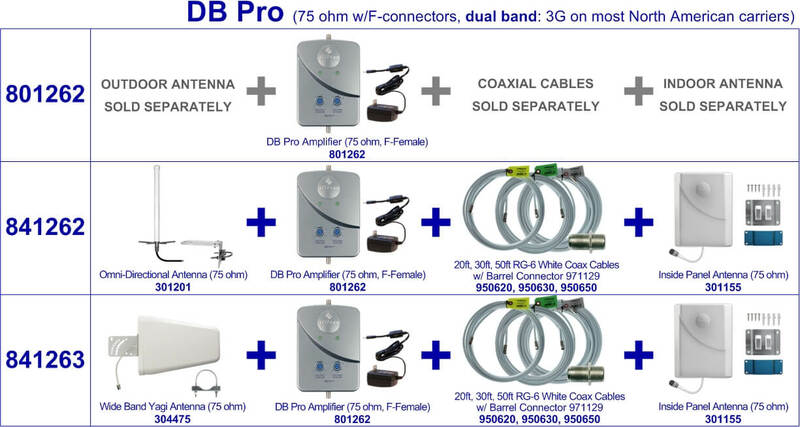 DB Pro Kit 841263 includes a single-directional wide band Yagi antenna (304475). This particular antenna requires being pointed in the direction of the nearest cellular tower. It is highly powerful capable of picking up cellular signal from almost every frequency. Installing this solution is difficult as it involves finding out where the closest cellular tower is. This solution is highly recommended for areas with weaker outside cellular signal. There are many practical expansion kit, mount, antenna, and cable add-ons for the 75 ohm DB Pro products. Available RG-6 coaxial cables are the 2ft (950602), 20ft (950620), 30ft (950630), 50ft (950650). The barrel connector (971129) can always be used to quickly join two cables together. The Omni antenna mount (901133) is included in the DB Pro 841262 kit. The 10in pole mounting assembly (901117) can be used with either the Yagi or Omni antenna. 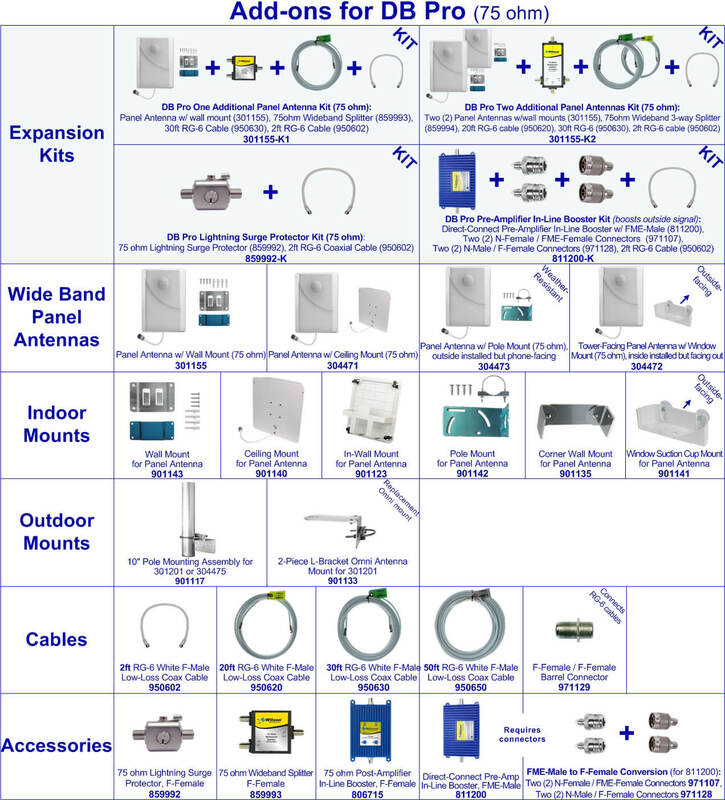 Both DB Pro kits come with all basic mounting hardware for both the indoor and outdoor antennas but various other mounting options are available. Remember that adding a lightning surge protector requires an additional 2ft cable and adding 1 additional panel antenna requires a splitter and a 2ft cable (or other length cable). Consider the plug-and-play expansion kits for safe and easy system customization. For large houses or buildings it is important to extend the indoor area coverage by adding extra indoor panel antennas to rebroadcast the boosted signal to separate floors or areas of the building. Additional panel antennas with four different mounting options are available. The 301155 panel antenna includes a wall mount, the 304471 includes a ceiling mount, the 304472 includes a window mount, and the 304473 includes a pole mount. Six separate mounts (without antennas) are also available: wall mount (901143), ceiling mount (901140), window mount (901141), pole mount (901142), in-wall mount (901123), and corner wall mount (901135). For installing additional inside antennas, a post-amplifier (806715) might be a good option. A post-amplifier attempts to offset the loss from additional cables and requires to be purchased with splitter (859993), one short cable (to connect the post-amplifier to an inside antenna) and one long cable (to connect to the amplifier). For areas of very poor outside signal, consider adding a pre-amplifier and/or a post amplifier to your DB Pro system. A pre-amp is installed in between the outdoor antenna and amplifier and the post-amp is installer between the amplifier and the indoor antenna. Required to set up a pre-amp or post amp is an additional short cable to integrate it into the system. Since the pre-amplifier utilizes FME connectors and the DB Pro it utilizes F connectors, converters are required. For each of the two FME-Male connectors on the pre-amplifier, a convertor from FME-Female to N-Female (971107) and a convertor from N-Male to F-Female (971128) are required. A kit which includes the pre-amplifier, the four connectors (two of each of the ones described above) and a 2ft RG-6 cable (950620) is available in a prebuilt kit (811200-K).